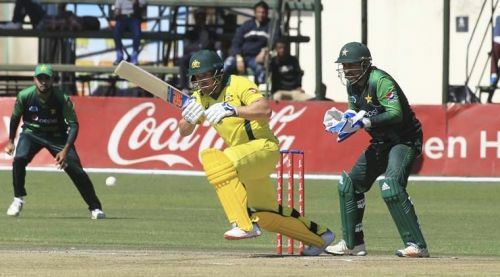 Aaron Finch and Sarfraz Ahmed, both would be hoping to lead their side from the front. Pakistan won the 1st T20I against Australia with ease and were the clear favourites to win the second T20I. Babar Azam scored a decisive half-century and everyone expected him to continue his good form in the 2nd T20I. Pakistan won the toss and opted to bat first, Shoaib Malik was back in the playing XI in place of Hussain Talat. Australia also made a change by bringing in Mitchell Marsh in place of Ashton Agar. After opting to bat first, Pakistan hoped to get a good start but unfortunately, Fakhar Zaman continued his poor run of form and got out for 11 in the fourth over with only 29 on the board. Mohammad Hafeez and Babar Azam stitched a 70 run partnership for the 2nd wicket before Hafeez departed for a well made 40. Babar Azam made 45 runs before he was caught out by Finch at long-off. Once again, Pakistani batsmen failed to live up to the expectations as they tumbled from 99-1 to 131-6 in the span of 30 deliveries. Asif Ali failed to score big as he got out to Stanlake. Shoaib Malik failed to get going as he too departed after scoring 14. Faheem scored 15 off the last over and helped Pakistan score a decent total of 147 in 20 overs. Australian bowlers did well to restrict Pakistan to a score of 147. Coulter-Nile, who was expensive in the last match, conceded just 18 in 3 overs with three wickets to his name. Stanlake and Tye who were economical in the 1st match conceded 36 and 40 respectively in their full quota of 4 overs. Tye went for 15 in the last over and went wicketless whereas Stanlake picked up two wickets. 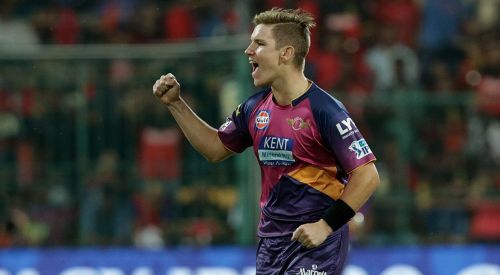 Zampa was also wicketless but was economical giving away only 21 in his 4 overs. Short was also given the ball and he was rewarded with the wicket of Babar Azam and conceded only 16 runs in 3 overs. Mitchell Marsh who was in the playing XI in place of Agar bowled only one over giving away 5 runs. Australia would have definitely wanted to put up a good show with the bat after the 1st match debacle. Australia once again did not get a good start with D Arcy Short departing on the last ball of the 3rd over in the most unfortunate manner. Aaron Finch hit the ball straight towards the stumps at the non-striker end, which on the way touched Imad Wasim's fingers. Short's bat was in the air and he was given out by the 3rd empire. Imad Wasim once again took a wicket on his last ball of the next over he bowled, this time it was Lynn. Lynn struggled in his 12 balls 7 runs short stint before edging the ball towards Shadab Khan at mid-off who took a good diving catch. Finch got out to Shadab Khan leaving Australia on 31 for 3 in 6.3 overs. Mitchell Marsh and Alex Carey were sent back to the pavilion in the span of 5 balls. McDermott was run out by Fakhar Zaman in the 14th over. Maxwell scored 50 runs off 33 balls and stitched a 59 runs partnership for the 7th wicket along with Coulter-Nile but that wasn't enough to take Australia over the line as Pakistan won by 11 runs and winning the T20I series 2-0 with one match left in the bag. Imad Wasim conceded just 8 runs in 4 overs. Imad Wasim had again opened the 2nd innings with the ball and conceding 8 runs in 4 overs and picking up one wicket. Shadab Khan took two wickets giving away 30 runs in 4 overs. Hafeez and Shaheen Afridi scalped one and two wickets respectively. Faheem Ashraf and Hasan Ali went wicketless.